Limavady's Callum Brown is off to the Sydney Giants. Brown joins the Australian club as a rookie on a two-year contract ahead of the 2019 season and becomes the latest graduate of the excellent Oak Leaf underage coaching structure to make the move, following in the recent footsteps of the likes of Conor Glass and Antony Tohill. The Sydney based club had been following the progress of one of Derry’s brightest young stars since identifying Brown via their Irish Scouting program back in July 2017 with the Limavady man travelling to Australia in August to spend two weeks training with the club. Former Cavan player Nicholas Walsh, a defensive coach with the Giants, had also watched Brown play for Limavady earlier this season. “Callum really impressed when he spent time at the club earlier this year,” explained McCartney. “He’s an incredibly athletic and skilful player and showed an ability to pick up the nuances of AFL footy during some intensive training sessions. “We know it takes time to adapt to our game and we won’t put any pressure on him but as an 18-year-old, he’s a really exciting prospect. Brown will move to Australia next month and begin training with the club’s first-to-fourth year players who resume training on November 19th. The move is a blow for Oak Leaf fans who had hoped to see Brown make the step into the senior county squad but he could yet be sent on his way ‘Down under’ with an Ulster Club championship medal as the Wolfhounds prepare for an provincial junior semi-final against Fermanagh’s Aghadrumsee which has been pencilled in for Sunday, November 4th. The final - should Limavady qualify - is set for Sunday, November 18th. That Ulster campaign is off the back of Limavady’s clean sweep of Derry junior trophies this season and while Brown’s departure will be keenly felt at county level, it will be felt more acutely at the Limavady club who make the step back up to Intermediate football next season. 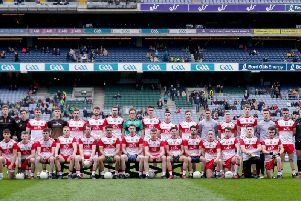 Brown was a member Derry’s Ulster minor winning team of 2017 and made a huge impact off the bench as the Oak Leafers lost out to Kerry in the All Ireland final that same season. This year he was an integral part of Mickey Donnelly’s Oak Leaf side that won the Ulster Under 20 Championship.